A majority of the people out there are looking for a kitchen faucet that comes made of good material, offers good features, and comes with a reasonable price tag. The reasonable price here commonly refers to the low price of the product. If you are such a person then the American Standard Colony soft pull down kitchen faucet is one of the best among the low priced kitchen faucets available on the market today. We have come across more than 100+ kitchen faucet and have reviewed the same; some of the product came with surprising features and some faucets with the features we expected. However, when it comes to American Standard Colony Soft pull down kitchen faucet, we were very surprised with the features that came incorporated into the product at the price it came. Unlike most of the low price range products on the market today, the American Standard Colony Soft kitchen faucet comes with unmatchable features. The pull down spray head comes incorporated with a water flow pause and spray pattern selection controls on it. This feature is not commonly found in any low price range products. The spout comes coupled as a swivel that could rotate 360 degree and the entire body is made of high quality brass. The manufacturer offers an escutcheon with this product, which alone is a big bonus for a low priced product. The American Standard Colony Soft 4175.300.002 kitchen faucet, as attractive the price is, it comes in two different color and finish variants and in two design variants. As we have mentioned in the beginning, this kitchen faucet has been offering surprising features that could not be found in any other kitchen faucet at this price range. Yet another feature that we found exciting was that the entire product is rust, corrosion, and scratch resistant. The manufacturer claims that the product will stay new, no matter what type of water you expose the faucet to, another important feature is that the product is made of brass and is double coated for enhanced durability and for long lasting properties. The ceramic disc valves incorporated into this kitchen faucet ensures that the product is drip free throughout its lifetime. The ceramic disc valves are also, in a way, maintenance free and are guaranteed to long last. One of the notable things about this product is that the product comes tested and certified to last longer than a million cycles use. The product comes designed to meet the NSF standards and the memory position handle and its valves are designed to meet the ADA requirement. The memory valve used in this product is of high quality and is often, only found in medium price and premium priced products only. This feature alone could help the user to freely use the faucet without worrying about temperature of the water when they turn on the flow. Apart from the entire feature mentioned above, this kitchen faucet comes with a lifetime warranty on its functions and a limited lifetime warranty on the color and finish. Unlike most of the low priced products on the market, the American Standard Colony Soft kitchen faucet comes with almost everything required for the installing of the product. This includes the supply hose to base plates. The base plate could be avoided if you do not prefer using it as the product comes designed to be installed with base plates or without base plates. Yet another thing that you should know before purchasing the product is that the spout end where the spray head is docked has a slight tilt, which means if you have a small sink this could be an issues. On the other hand, if you are still purchasing the product undock the spray head, then point it away from the sink edge, and then turn on the flow. There is one more thing that you should know, if the weights are not placed at the right places as mentioned in the manual and then the hose will not retract in a proper way. So, if you are not planning to seek any professional help, then make sure you read the manual carefully and install the product. At the price the product comes in and the features and quality it offers, it was a difficult task to find a direct competitor to this kitchen faucet. In a way, we have failed to find a direct competitor to the product; however, we found something that might stand close to American Standard 4175.300.002. The Commercial Brushed Nickel Stainless Steel Single Handle Kitchen Bar Sink Faucet, which seems to be close to some feature and quality offered by the American Standard 4175.300.002. However, one of the major drawbacks of the product is that this product lacks a retractable spray head feature and lack of this feature could be a real deal for most of the customers. As the product lack such an important feature, the price of this product is also comparatively low. Therefore, if you are a person who does not want a pull down spray head feature, then the Commercial Brushed Nickel Stainless Steel Single Handle Kitchen Bar Sink Faucet is the best option for you. The price of the product today is a bit more than what the real price was a few months ago, if you could wait until the next sale days, you might be able to grab the product at a comparatively lower price. However, remember, for its quality, feature, and the price it comes at, it is one of the best kitchen faucets that you could get, and this alone has kept the demand for the product strong and steady. Therefore, if you are planning to wait for a sale, you most probably might not get the appropriate color or finish variant. There are more than 100+ low priced kitchen faucets in the market today, but none of them could match the features offered by the American Standard Colony soft kitchen faucet. The things that we like the most in this product is that it comes with pull down spray head that comes incorporated with flow control buttons. The flow control buttons placed on the spray head enables the user to control the type of flow, as well as, pause the flow in between. Yet another important feature that we liked about this product is that it is made of brass, which is double coated by the manufacturer for enhanced durability. Another important thing about this product is that the manufacturer offers all the necessary hardware’s required for installation with this product, which means the user can get the kitchen faucet at a lower price and do not have to spend anything extra to get the hardware’s. 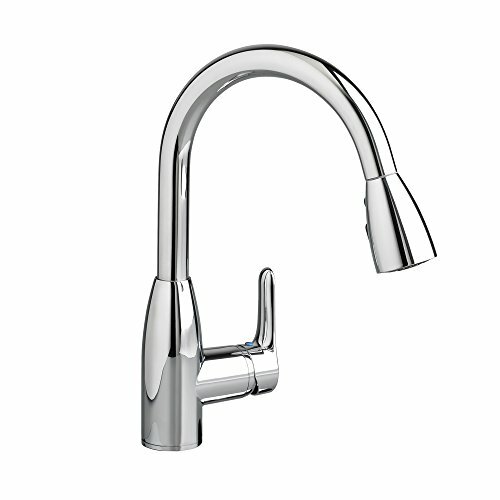 Unlike most of the kitchen faucets on the market today, the American Standard 4175.300.002 comes with a lifetime warranty on its functioning parts and a limited lifetime warranty on its color and finishing, we have not seen such a grant offer from any manufacturer on a product with such low price.